This entry was posted on October 27, 2009 at 11:19 PM and is filed under baking, fruit, recipes, salads. You can follow any responses to this entry through the RSS 2.0 feed. You can leave a response, or trackback from your own site. yes, do try that recipe for Persimmon Bread. It’s terrific! I did. And it is. Thanks for sharing, David. Try the Fuyus in a salad with roasted hazelnuts and hazelnut oil and a mildly bitter green, like Belgian endive. Also, you can let them get soft, then use the pulp in persimmon puddings, persimmon bars, or wherever else pulp is called for. And whatever you do, make a persimmon pudding! Love the hazelnut salad idea. On the must-try list. Thanks for the suggestions. Like you, not a big fan of persimmons. But, yes,the persimmon bread is delish. There was also a persimmon salad recipe in last year’s BUSD school lunch calender. Thanks for the mention Sarah, and link to my recipe. A favorite way to enjoy Fuyu persimmons around my house, is to simply slice them and squeeze with a little lemon juice. My daughter eats them like an apple-meaning out of hand and with a big bite. Thanks for the tip, Nani, which I did try. And yet if there’s an apple, pear and persimmon in the fruit bowl I’ll reach for the first two every time. 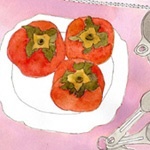 Hi Sarah — A friend sent me this recipe for Persimmon Pudding, and he says it’s delicious, although I haven’t tried it yet. A confession: I’ve never eaten a persimmon, but now I intend to! 1. Put persimmons in a blender, skins and all (minus stems and black spots); add to pulp soda dissolved in the warm water, brandy and vanilla. Set aside. 2. Resift flour with the salt, cinnamon and nutmeg. Add sugar and melted butter. Add dry ingredients to pulp, then both eggs and then raisins. 3. Boil water in a large pot and place ingredients in a buttered pudding mold (with cover), and cover mold 2/3 to 3/4 of the way with water. Thanks, Connie. This sounds like a perfect holiday dessert. 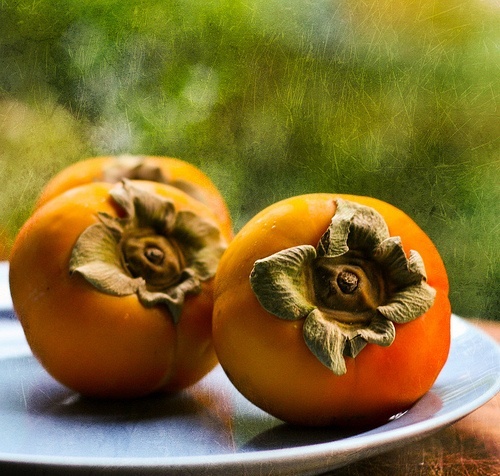 Have you tried a persimmon this season? I have two huge persimmon trees in the backyard (Sarah have you noticed them? You’ve probably avoided them!) and I have to admit that the fruit are most appreciated by the visiting fruit bats. Certainly an acquired taste! But with the help of these recipe links, I might get a bit adventurous next season! I had the puckery persimmon experience in childhood (persimmon trees grew all over Healdsburg, where my dad lived) and didn’t try them again for a decade. Then a year or two ago I discovered Fuyus and a relationship was born. Love them, just to eat plain. These recipes do look tasty, though, at least the lower-maintenance ones! Scared you off for a decade, hey? Good for you for giving the (ripe) persimmon another chance. I’ve had two persimmons in my fruit bowl for over a week and I have to keep waiiiiiiiiiiiting and waiiiiiiiiiiiting. I don’t think they’re a good fruit for impatient people. I hear you. Spent weeks waiting for my Hachiya to ripen and, well, let’s just say I left it a tad too long…hello compost. Can’t wait for you to take on loquats and kumquats! Thanks to Deborah and Connie for additional recipe ideas and to David and Margaret for encouragement on the persimmon bread front. Yes, Asiya Wadud is another wonderful human being – a fruit forager! I love her story too. http://www.thelemonlady.blogspot.com – ideas about fruit harvesting and local pantries. Good post, thanks a lot!